Running toilet quote…..Is all an email said earlier this week, with the attached picture. Is it a close coupled suite? Or are the pan and cistern separate? Is it the inlet or outlet valve leaking? Does the water turn off at the control valve? 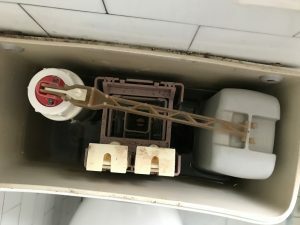 Is the connection between the control valve and the cistern hard drawn tube or is it one of those flexible braided connections? The flushing toilet is a wonder of the modern world we can take for granted considering our previous post about 4.4 billion people not having a toilet. Our local bathroom suppliers currently have 48 different types of toilet cisterns on display and that’s not including the antique in our picture. They all have different water connections and flushing mechanisms. So please, help us help you by providing as much information as possible about your particular leaking toilet. In the meantime, you can turn off the water and flush your loo with a bucket. With the population of the world now at approximately 7.7 billion people, many of us would be surprised to learn that over 4.5 billion people do not have a clean toilet or running water to wash their hands. According to a UN report, a third of schools worldwide don’t have any clean toilet facilities and nearly 1 billion school children don’t have hand washing facilities. It seems extraordinary that in a world where most people have a mobile telephone approximately 892 million people have to squat out in the open. This, of course, has knock-on hygiene effects with the pollution of domestic drinking water being a direct contributor to many cases of sickness disease and even death for those less fortunate than us. Today, as you use your dual flush toilet in the privacy of your home, workplace or school, spare a thought for these people. You may also consider buying Who Gives a Crap toilet paper. Who Gives a Crap donate 50% of their profits to help build toilets for those who have none.